Stressless Wave Low-Back Loveseat- Enjoy Stress-free Ordering and Delivery at Unwind. 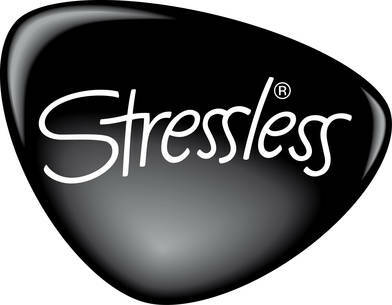 Feel the daily stress disappear when you order a Stressless Wave loveseat from The Unwind Company. Choose your preferred leather type and color by using the pull down menu above, which is titled: "Select Leather or Fabric Type and Color". We also delivery Fully-Assembled, Brand-New items right through the front door of your business or home with the Fastest Shipping Methods available. Our stocking program allows us to keep recliners in stock for immediate-shipping, delivered to virtually anywhere in North America in 1-5 business days. All of our items are backed by the rock-solid 10 year Manufacturer's Warranty at no additional cost. You can truly relax and unwind when you choose the world's most advanced recliners. From the patented technologies, to the outstanding construction and engineering, down to the incredibly useful accessories, you will be able to relieve stress and tension and promote a genuine sense of well-being in this seating solution. This love seat is a very popular model of Ekornes Furniture. The Loveseat is designed to accomodate 2 users and function in the same exact manner as the matching Stressless Recliner. This means it includes the distinctive benefits of Stressless Design (Glide System, Plus System, Premium Leathers, etc.) The distinctive horizontal division to the Comfort Zones is its signature style. This type of Comfort Zone/seam allows for a strong focus on padding in the lumbar regions and upper shoulders/neck. We are constantly called to sacrifice our comfort to avoiding spending a dollar. The Wave is calling. It invites you to indulge. Dive deep into a world of comfort and ultimate relaxation and you will never regret it. 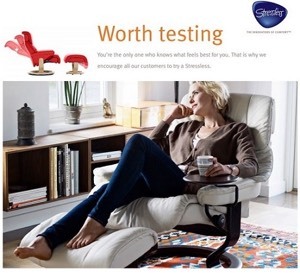 The numerous health benefits and lifestyle improvements related to Stressless furniture are intentional results of the numerous patented technologies engineered at Ekornes in Norway. Choose Free Inside Residential or White Glove Delivery! Select the White Glove option if you would like your Stressless Sofa brought into your home, set up where you want it, and to have our delivery teams take away all of the packaging. This is truly a frustration free experience. Matching Stressless Recliners: The Atlantic (Medium) & Pacific (Large). These two are not shrimps by any measure. They still bring a tidal wave of padding, comfort and overall design. The Atlantic & Pacific Stressless Recliners feature the same seaming and "Comfort Zone" design as The Wave Sofa and Loveseat. They bring the highest levels of comfort and support to you at a lower than average Stressless furniture Cost. Once you sit down and let your body sink into the extremely soft cushioning, you'll know that you've reached a level of comfort you could previously only imagine. The Stressless Atlantic and Pacific are a couple of the most exquisite and refined recliners ever designed by Ekornes. Stressless Wave Low-Back Loveseat Dimensions: Width: 57.5" Height: 33" Depth: 32"
10 Year Warranty from The Manufacturer: Ekornes.